You’ve seen headlines like “Puppy Love: Pet Owners Are Happier, Healthier” and "How Pets Save Us Billions Every Year In Health Care Costs!" And it is true that a lot of studies have reported that pet owners have better physical and mental health than people who do not live with companion animals. But as I have pointed out in previous posts, the results of this body of research have been mixed (here and here). Further, we do not know whether getting a pet causes better health, or whether the causal arrow points in the other direction. In other words, pet owners might be different to begin with. If so, non-pet-related differences such as socioeconomic status might be the real cause of better health for companion animal owners. For example, people who are married, white, female, and wealthy have lower death rates. If individuals with these characteristics are also more likely to live with pets, we could wrongly conclude that it is dog or cat ownership that makes them live longer. If we really want to understand the effects of companion animals on human health, we also need to know how pet owners and non-pet owners differ in terms of demographics. Investigators from the Rand Corporation and UCLA used a large data set to address this question. 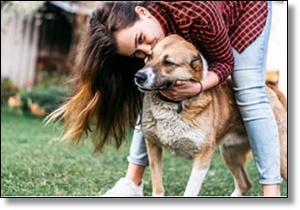 Recently published in the journal PLOS One, their research report offers important insights into the differences between pet owners and non-pet owners and the impact of pets on our health.